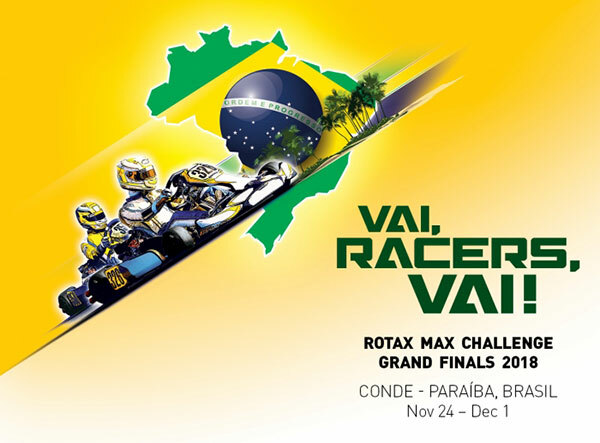 Not even two weeks until the Rotax MAX Challenge Grand Finals will take place in Brazil. The 19th edition of the Grand Finals will see 360 of the best kart drivers from close to 60 nations who won the so called BIG TICKET for the biggest and most prestigous kart event of the year – competing against each other in 6 different categories to finally crown the Rotax MAX Challenge Grand Finals champions of 2018! *The age limits for Rotax 125 Micro MAX and Mini MAX c lasses may vary depending on the regulations of the national ASN. An essential goal for the chassis manufacturers and the Rotax organization was having all the 360 chassis, engines, tools and equipment prepared for the early shipment to South America which took about two month. A fresh challenge, not only for the Rotax organization team, also for its long-term chassis partners who are all coming from Europe. Thrilling e-kart races can be expected to take place at the Circuito Internacional Paladino from November 25 to December 1, 2018 showing a new way of kart racing. The e-kart presented in the e-kart races will be the Rotax THUNDeR, which has already been used this year in the DEKM (Deutsche Elektro-Kart-Meisterschaft), the German electric kart championship. The Rotax THUNDeR powerpack, developed in cooperation between RIC TECH GmbH and S.M.R.E.’s subsidiary IET S.p.A., features a specially designed Sodi chassis based on the Sigma DD2. Live TV broadcast will start November 28, 2018. Follow the races and keep your fingers crossed for your favourite! All three teams on the GP2 podium at the demanding 24 Hours of Karting in France were more than confident in the performance and reliability of their Rotax 125 MAX, completing over 2000km during this most gruelling race using only one engine. RM Concept (FA Kart/Rotax) took the deserving victory with a two-lap lead over their closest rivals at the chequered flag, while Malevaut Sport (Tony Kart/Rotax) and Team Belinois Jac-Kart (Sodikart/Rotax) fought it out for the remaining steps on the podium – both within the same lap after 24 hours of extremely close racing. The winning drivers in the #60 entry were Gaël Moreau, Sacha Hebrard, Jonas Venier and Jacques Missimilly, whose compatibility and consistency proved to be another key factor that contributed to their successful campaign in securing the 2018 title. The French team RM Concept also won the Ladies classification in the #67 kart (FA Kart/Rotax) all-girl team of Lydie Valichon, Léna Buhler, Caroline Martel and Léonie Claude competing in their third 24 Hours of Karting Le Mans together. The Rotax European series was reborn with a new 3-day format and sporting a new name as the Rotax MAX Challenge Euro Trophy and it was a success in 2018. Competitors coming from over 30 countries participated in the four-round international championship where the racing was exciting and the competition remained close for the titles and all the Rotax MAX Challenge Grand Finals tickets right up until the last race of the season.